Is Your Donation Form Helping or Hindering Conversion? Many people think the nonprofit world can learn a lot from studying the best practices of the for-profit world. 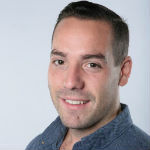 William Harris, our Classy Pay Product Manager, is one of them. He foresees a heavy cross-pollination between checkout forms in online stores and a nonprofit online donation form. As Harris tells it, there are trends for these modern, online forms which people either like or dislike, both consciously and subconsciously. We sat down with Harris to discuss the specifics surrounding these latest online form trends and why they matter to nonprofits and their supporters. When meeting someone for the first time, humans make snap judgments about them in 0.10 seconds. Your site has even less time: people decide if they’re going to stay or leave after only 0.05 seconds. So, if your site looks outdated, people might not feel compelled to consider a donation. Similarly, if your site has a modern and engaging aesthetic, but your donation form is out of date, people may lose their enthusiasm and also decide not to donate. A new, modern look and feel has a major impact on whether somebody decides to put their credit card in your donation form,” explains Harris. There are added expectations when it comes to the security and safety of a transaction. Your supporters need to feel that their credit card and personal information is protected, and you can build that trust directly into your site design. Graphics of a padlock or unbroken key icon give credence to your security, but Classy goes a step further. 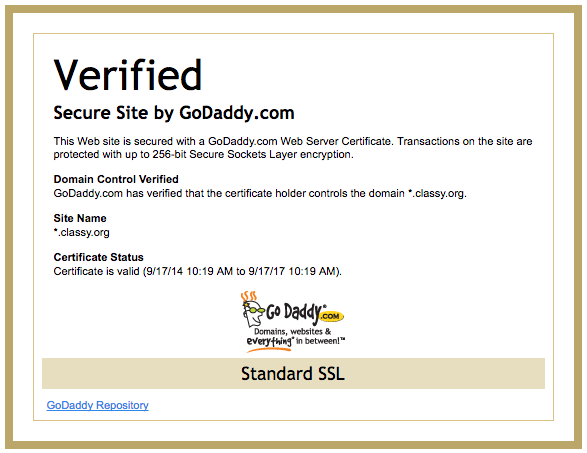 Every Classy donation form is embedded with Secure Sockets Layer (SSL) technology, shown in an SSL certificate. SSL technology allows private information to be transmitted without the problems of eavesdropping, data tampering, or message forgery. It lets perspective donors know their connection to your server is safe. The desire for security is a conscious giving preference. People want to see this type of security before putting their credit card information in a donation form. Beyond this giving preference for security, successful online forms also take other preferences into account. As Harris tells us, one of the strongest subconscious giving preferences is an inclination for simplicity. When it comes to encouraging donors to give, your donation forms need to be simple to fill out. This trend is something almost all modern, online forms incorporate. If a potential donor goes to a page packed with boxes to fill in, they might abandon their donation. Harris brings in the familiar example of ordering food in today’s app-driven world. If you want to order a pizza, you can use Eat 24, GrubHub, Postmates, or Uber Eats. Someone might choose Eat 24 because the app has integrated PayPal options. Others might choose Postmates because of the live tracking feature. Any way you spin it, people’s biases factor directly into which platform they use and how often they use it. They choose what’s simplest for them. What’s interesting is that, often, this choice is made subconsciously. As Harris tells us, the giving preference becomes so embedded through repeated use that it just happens. We all have preferences, but we don’t realize what they typically are,” says Harris. “My job is to address those subconscious preferences and let people give the way they want to give, in the most streamlined fashion. When a potential donor gets to your form, they’ve psychologically committed to considering to donate. The trick here is to have a simple pathway built that converts this sentiment into a concrete donation. The best, modern donation form treats giving as an important conversation and attempts to build a relationship with the donor. Say, for example, someone signs up to volunteer for a beach cleanup. A successful donation form capitalizes on the opportunity to start a conversation and turn it into a conversion. It says, “Hey, if you donate $5 in addition to signing up, you create a direct impact during the event by making ‘X’ possible.” In this scenario, “X” is whatever value proposition you want to offer the donor. The donor came to sign up for your nonprofit event, but your form compelled them to convert. There was an immediate, noticeable opportunity to make an impact. The important part is that the relationship and subsequent donation are built through conversations, not demands. A donation is important, but relationships are more important for organizations, especially long-term relationships,” says Harris. “Long-term relationships factor directly into recurring giving. By framing your donation form through a conversational lens, you can accomplish more than just boosting conversions. It’s a smart way to gather relevant data about your supporters as well. This back-end information about donors is important because it helps your nonprofit segment your demographics and further build out relationships that foster recurring giving. 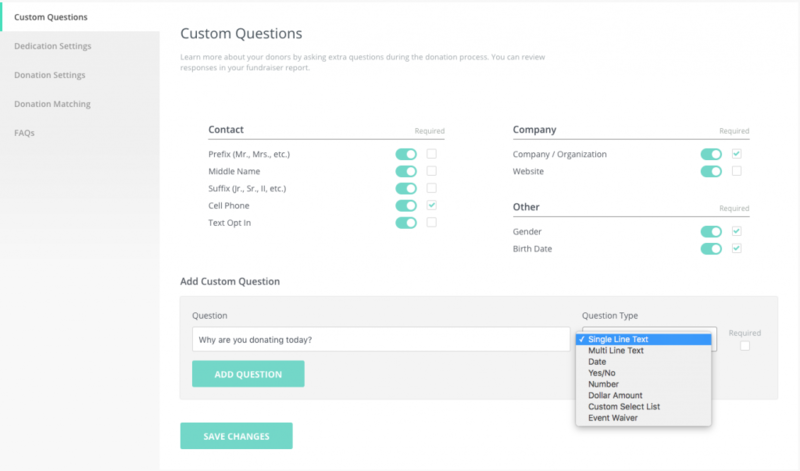 Classy’s Fundraising Suite has the option to add custom questions you think are important to a donation form. It can help you figure out who your audience is—beyond a name—and the best ways to engage them in future conversations and fundraising initiatives. An example of the custom questions you can add in the Classy Fundraising Suite. Remember, the key is to ascertain this data without stifling the will to donate. You don’t want to flood your donation form with boxes and risk losing your supporters’ interest. Online forms are more than just boxes on a page that need to be filled out. They have the potential and power to provide entirely new levels of transparency and insight about the people who support your organization. Not to mention, they can help drive more donations as well. There’s no need to reinvent the wheel with online donation forms though, they’ve existed for years. For-profit companies have also been following these tricks of the trade for a while now. Classy analyzes these trends and builds them into our Fundraising Suite so nonprofits can take advantage of them easily. We want to help you build the best online form in the world,” finishes Harris.